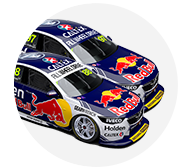 Jamie Whincup has described driving by feel in the closing stages of Race 17 after damage to the front of the #88 Red Bull Holden obscured his vision. Whincup was an innocent party in the restart fracas between team-mate Shane van Gisbergen and Shell V-Power’s Scott McLaughlin. 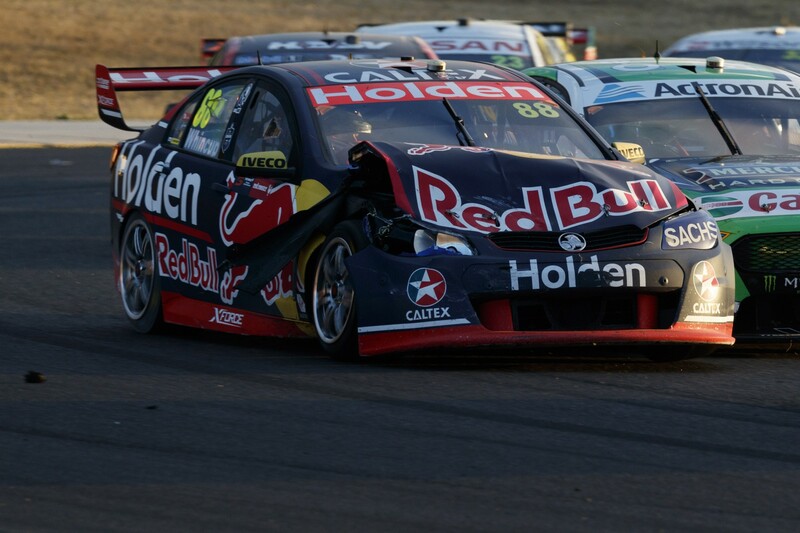 The six-time champion's Commodore took a big hit on the nose in the concertina caused by McLaughlin spinning van Gisbergen at turn 2. Whincup’s car immediately began billowing smoke from what at first appeared to be race-ending damage. Whincup not only finished but he did so without even needing to pit, taking the flag in third place behind winner Fabian Coulthard and Prodrive’s Chaz Mostert. “I don’t want to say too much because I probably should have been black flagged. I couldn’t see a thing.” said Whincup of the closing stages. “Coming down the straight I was on the grass. I didn’t know I was on the grass until I felt the car was wheel-spinning and pointing sideways. “Over the hill was shocking though. I was sort of pushing myself up as hard as I could in the seat, and looking over the top. I couldn’t see a thing. “I was just looking at landmarks and trees and things around the track to try and get an idea of where I was. “Thank god it’s a circuit we’ve been to a lot, because a new circuit I would have been absolutely knackered. It’s a place you know and you’re just going by feel on the bumps and half know where you are. While noting that his car’s water temperature “got up a little bit”, damage to the right-front tyre was his greatest concern. "The tyre, I was sure that was going to blow out," he said. "The amount of smoke that was pumping out... on the straight I felt the brakes were coming on, every time we’d bounce it would bind up on the tyre and the brakes were coming on. "I was sure I was going to last two laps max. Somehow, someone was looking down on me and it lasted the full 11." Although third was a strong result considering the damage, Whincup felt he was in the box seat for victory with his tyres five laps newer than the two leaders after a later pitstop. “I can’t remember the last time a Safety Car worked in my favour, I couldn’t believe it, I was saying ‘what’s going on here, this is not right, I’ve pitted and the Safety Car has fallen into my hands'," he said. 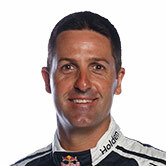 Third place sees Whincup close McLaughlin's championship advantage from 129 to 78 after 17 races.